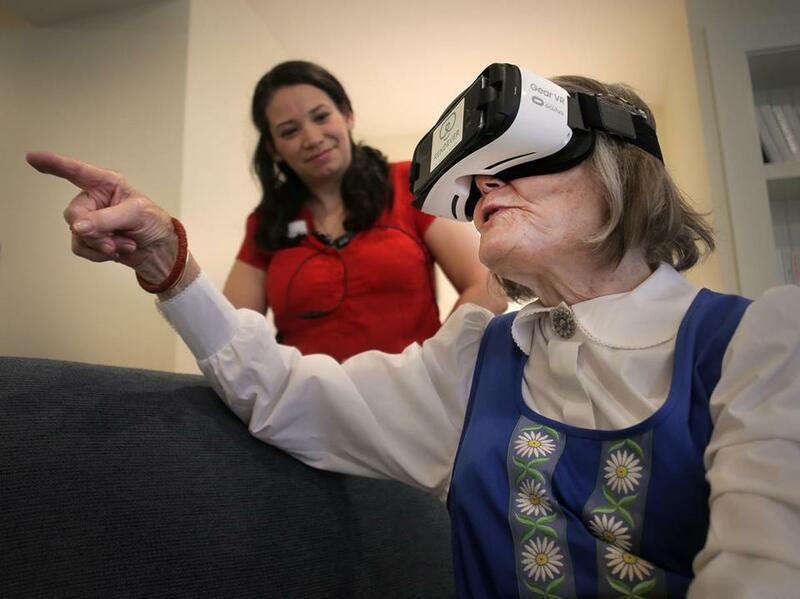 Anna Lisa Gotschlich, who lives with dementia, exclaimed about what she could see as she used virtual reality to take a virtual trip to her childhood hometown in Sweden. Delmy Flagg, Memory Care Director at Maplewood, listens. Pillo, a startup in Boston’s Fort Point district, has developed a robot that sits on your grandparents’ kitchen counter, greets them in the morning, and gently reminds them to take their pills. Another early-stage local company called Eversound sells wireless headphones whose volume controls let seniors with varying levels of hearing loss exercise or watch movies together. And a third Boston startup, Rendever, has created immersive software that can transport housebound elders to the African Serengeti and the Incan citadel of Machu Picchu, with the help of virtual reality goggles. These “age-tech” pioneers are part of a Massachusetts cluster of entrepreneurs who are applying the state’s potent mix of brainpower and technology prowess to an ancient problem: easing the burdens of growing old. Government and business leaders believe the emerging industry could have huge potential for the state’s economy, and for aging populations around the world. Last week, a consortium that includes General Electric and the MIT AgeLab, working with Governor Charlie Baker’s administration, unveiled a global innovation challenge seeking to generate new ideas for technology-assisted aging. Baker outlined the “big opportunity” in an appearance before AARP’s annual volunteer meeting in Framingham last spring. Noting that Massachusetts has long been a high-tech and biotech center and a hub of universities and hospitals, Baker called for making the state the “Silicon Valley” for emerging products and services that reduce social isolation and loneliness for the older population. “We need to think differently about aging,” he said. It’s an unconventional approach to economic development, focused less on a particular set of technologies than on a fast-growing demographic of people who are living longer, have disposable income, and often are far from family members who might be first responders in health emergencies. “The real idea is to throw a lightning rod on the ground here in Massachusetts,” said Joe Coughlin, director of the AgeLab at the Massachusetts Institute of Technology in Cambridge, and a member of the governor’s council to address aging. “We see this as a chance to make us a living laboratory and to bring the culture of innovation” to the problems of aging. There’s no shortage of demand. Scientific and economic advances have boosted life expectancy across the developed world, Coughlin wrote last year in a book called “The Longevity Economy.” American women who make it to 65 today can expect to live to 85, and men to nearly 83. Similar trends are seen in most western European countries, along with Japan and South Korea. 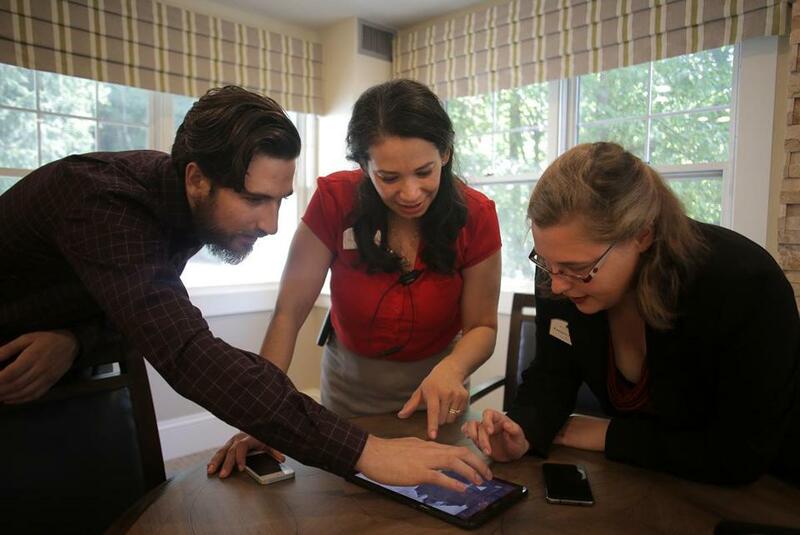 Tom Neumann, cofounder and CTO of Rendever; Delmy Flagg, memory care director at Maplewood; and Kimberly Davie, lifestyle director at Maplewood, chose virtual locations for the seniors. Because longer lives bring health and aging challenges, a multibillion-dollar industry has sprung up to meet them. The industry is highly fragmented, with giant companies like Boston-based GE and the Dutch conglomerate Philips dominating in areas like medical devices while a raft of startups turn out everything from video doorbells to voice-activated “smart” thermostats. The largest market segment, remote patient monitoring, is projected to draw reimbursement from health providers topping $2 billion this year, according to technology research firm IDC in Framingham. Other fast-expanding niches include “personal response systems,” typically activated by bracelets or clickers when older people fall, and “medication adherence” monitoring technology to make sure pills are taken at the right times and doses. Interest in the age-tech field was galvanized last month, when e-commerce goliath Amazon plunked down nearly $1 billion to buy PillPack, a Somerville-based online pharmacy that delivers prescription drugs to patients’ homes. Medicare, the government insurance for older Americans, could soon begin covering some patient monitoring systems. But many of the emerging technologies are consumer products, often purchased by adult children for their aging parents. Many age-tech entrepreneurs are inspired by firsthand experience with that shift. The idea for Pillo came from its cofounder and chief executive Emanuele Musini, whose father in Italy found it difficult to manage his medications and health care plan when relatives were living far away, said Aiden Feng, another cofounder. Feng, who earned an MD-MBA degree from Harvard, said Massachusetts is the perfect place to develop robots as “patient empowerment tools.” Its robot, named Pillo, “has a face, it recognizes you, and it’s a companion,” he said. Not everyone sees the age-tech boom as an unalloyed blessing. Alexandra Suchman, a management consultant in Washington, D.C., acknowledges some utility in the plethora of devices coming to market. But she worries that many may be too complicated for older folks to use. And she doesn’t see them as a substitute for human contact. Brian Geyser, vice president for clinical innovation at Maplewood Senior Living, a Connecticut-based company with locations in Weston and Yarmouth, focuses on user-friendliness when he scouts for technologies that improve the safety, health, and happiness of residents. The company is experimenting with Luna Lights, whose mattress sensors detect when older residents get up at night and illuminate a path to the bathroom. Maplewood is also considering tele-monitoring devices that track blood pressure and other vital signs and transmit them to doctors. On the happiness front, Maplewood has been trying out Rendever’s virtual reality software. In a common space at its Weston senior living community last week, four residents sat on a couch and chairs wearing headsets while Rendever chief technology officer Tom Neumann gave them a whirlwind tour of the Sagrada Família cathedral in Barcelona, the Eiffel Tower in Paris, and a seaside cliff dotted with rockhopper penguins in Antarctica. As the field evolves and innovations proliferate, established players like GE are taking a broader view of its potential, said Ger Brophy, head of cell therapy in the life sciences unit of GE Healthcare in Marlborough. “There’s a sense that this is an underserved market,” he said. The innovation challenge, which emerged from the governor’s aging council, will be managed by GE, using the same technology it’s deployed to crowdsource ideas in scores of other challenges sponsored by its far-flung businesses over the past six years. Up to four entrepreneurs or inventors will receive $5,000 each for the most promising ideas submitted by Sept. 28. More importantly, they’ll get their technology proposals in front of sponsors such as GE Healthcare and Benchmark, which runs a chain of senior living facilities throughout the Northeast. They, in turn, could help to test and commercialize potential products. Massachusetts is already proving a fine testing ground for a diverse range of “age-tech” startups. Nesterly, which offers “intergenerational homesharing,” works with the city of Boston to match older empty nesters and their spare bedrooms with college students who are looking for a place to live and are willing to shovel snow or take out the garbage for their hosts. Both the Rendever virtual-reality and the Eversound headphone systems are being piloted by Benchmark, which is based in Waltham and manages 56 senior living centers in the Northeast. Founder Tom Grape, who is cosponsoring the innovation challenge with GE and MIT, said the next generation of age-tech systems will evolve from simply monitoring and recording health data to predicting and preventing mishaps.